There is more than ONE kind of tortilla?!?! Typical for me, I started my Saturday morning off making a tortilla española. For anyone who’s been following my blog for any length of time, you will know I’m a big fan of these. I make them for myself on the weekend and then nosh on them all week long. If you’ve been to my house for a dinner, you might have had one for an appetizer, cut up into little bite size squares so you can pop into your mouth with the aide of a toothpick and a swish and gulp of your drink. 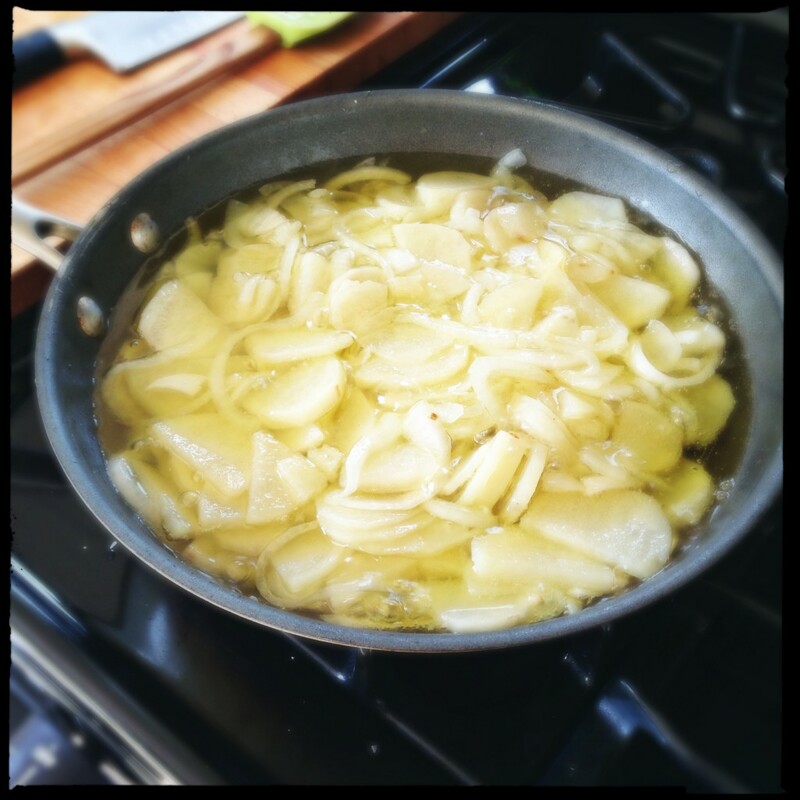 Gently cooking the potato and onion – almost a confit of potato. I’ve been asked, “Is it always just potato, onion, and egg?” or been told “It needs green in it”, the later statement (order?) made by a certain chef friend. I always make that same face though when confronted with those propositions: wrinkled nose and brow, questioning why I would want to ruin something so simple and so perfect. 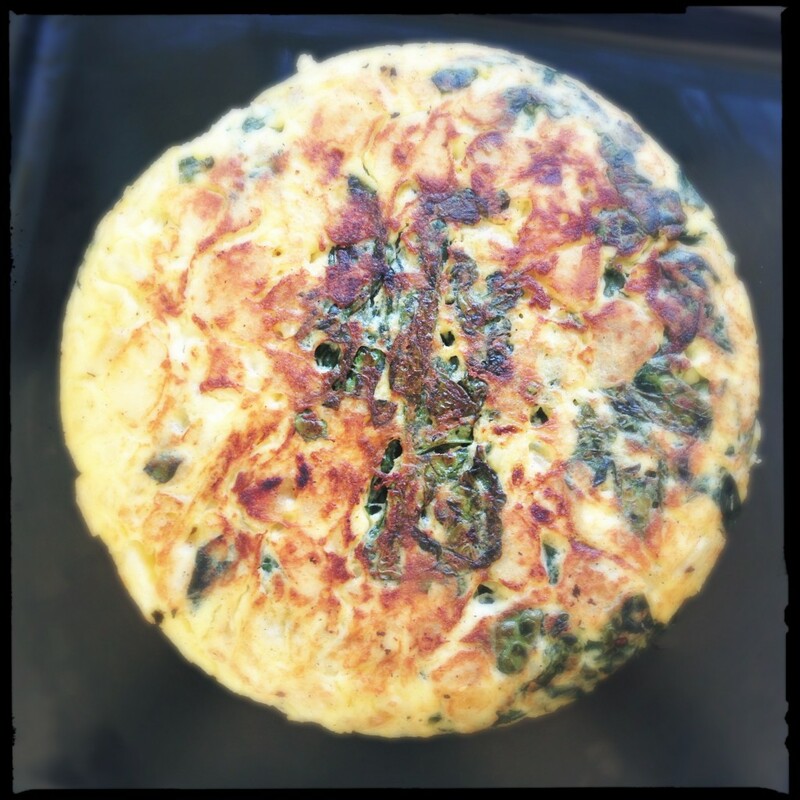 After all, it IS a tortilla española…there is nothing else in it but potato, onion, and egg by definition. And it was the only tortilla I really ever had growing up as a kid in Southern Spain. Recently I was forced to confront a truth that was contrary to my reality though. Shocking, eh? I was back east in Virginia on a work trip and was spending the night at my parents house. We had a few minutes before meeting the rest of the family for dinner and I spotted a cookbook on my parents shelf by Penelope Casas. This one was “Tapas – the Little Dishes of Spain”. I know of Penelope’s books, as my parents have many of them, speak her praises, and have even given me one as well – “¡Delicioso! 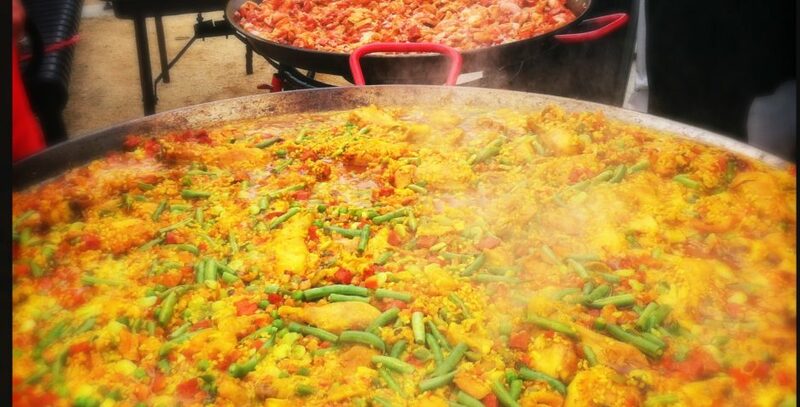 The Regional Cooking of Spain”. Her recipes are great and very authentic. I started flipping through the well used tapas cookbook, looking at the pages that had sticky notes I assumed indicated things they cooked a lot and/or liked. I found some gems that I had to have, so I started snapping pictures of the pages with my iPhone – marinated mussels in a vinaigrette, boiled potato, tuna, and egg salad, and those little yummy sandwiches I remember eating in Sevilla on my last trip (montaditos and pringas). Then I stumbled across the tortilla section and my tortilla world was rocked! There were recipes for tortillas with ALL KINDS OF THINGS IN THEM: swiss chard, green pepper, onion, baby eels, cheese and truffle (yum, right?! ), potato, chorizo and veggies… AND THERE WAS EVEN A SAUCE RECIPE TO SERVE ON TOP!! OMG! And it didn’t stop. There was a “3 layer tortilla” (tortilla de tres pisos). HOLY TORTILLAS BATMAN!! Then something even more bizarre happened. I recovered something akin to a repressed memory. Actual tortillas in Spain that weren’t just the classic tortilla española! I can’t remember the city, but I can see the street and the cafe in my minds eye. I remember getting the ever ubiquitous croquetas (a croquette – a small breadcrumbed fried roll of usually mash potatoes mixed with bechamel and other filling) and looking the food display case at the tortillas, remarking to my dad they they had the craziest thing over there – tortillas with OTHER things in them! HOW DARE THEY?! Well apparently, this is common in other parts of Spain that aren’t Andalucia, where we lived. We learn every day, but apparently I forgot that lesson until a few weeks ago. Oh – and the kicker to all of this is when I mention this “discovery” to my parents is that their response was one of, “Well, yeah duh…dad makes them with greens in it all the time! !” Like since when?? Sigh…. Humbled, I am. It’s like a giant delicious edible Pac-Man! You know where this is going now… When I went to make my tortilla this morning, it was not going to be a typical one. 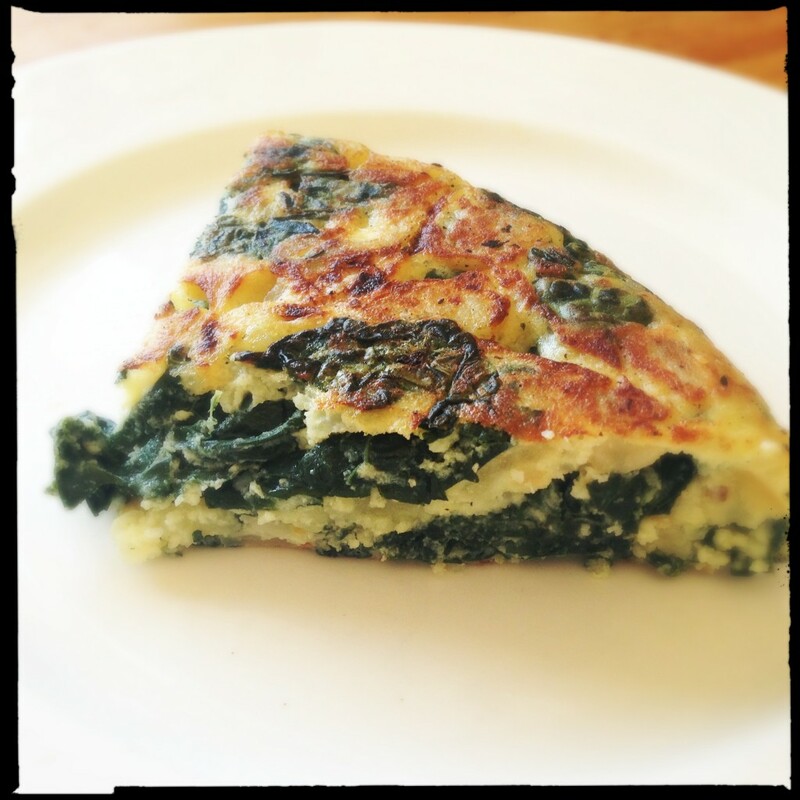 I had some tuscan kale from the garden that needed to be used, so in the tortilla it would go. I followed the basic tortilla recipe, but after setting the potatoes aside to drain, I sautéed the cleaned and chopped kale in the pan with the residual olive oil. That got mixed in the the potato, onion and egg mixture to soak for the 15-20 min time before cooking up the omelet. Otherwise, it goes just like any other “regular” tortilla. 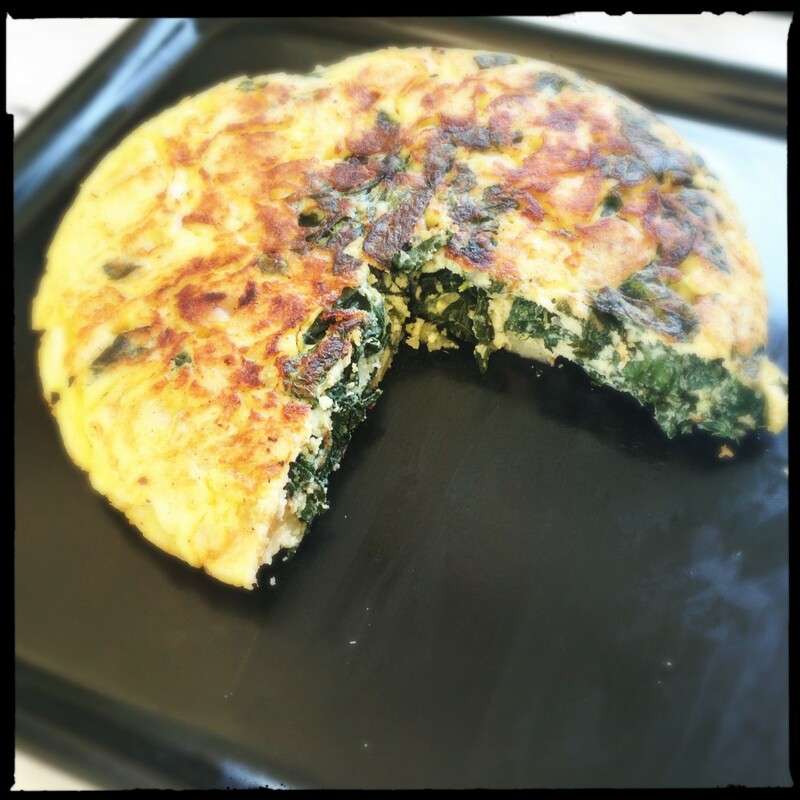 Let it cook and set up a bit and bueno – TORTILLA DE PATATA CON COL RIZADA (tortilla with potato and kale)! Breakfast, lunch, or dinnner. Cold or warm. Plain or on a sandwhich roll. I’ll take a tortilla anyway! One Response to There is more than ONE kind of tortilla?!? !